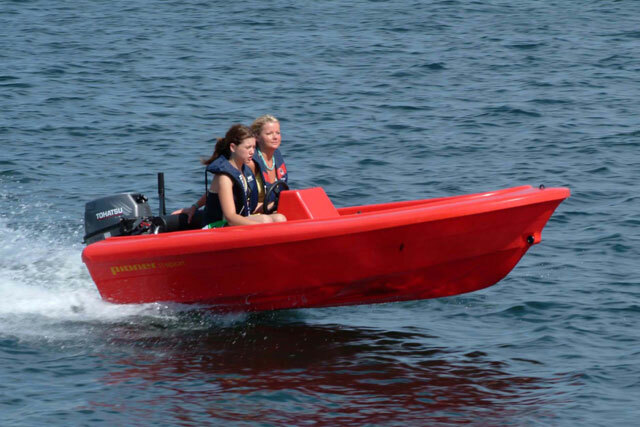 Alex Smith investigates the Broom 430, the latest new entry from the venerable Broom boatyard. 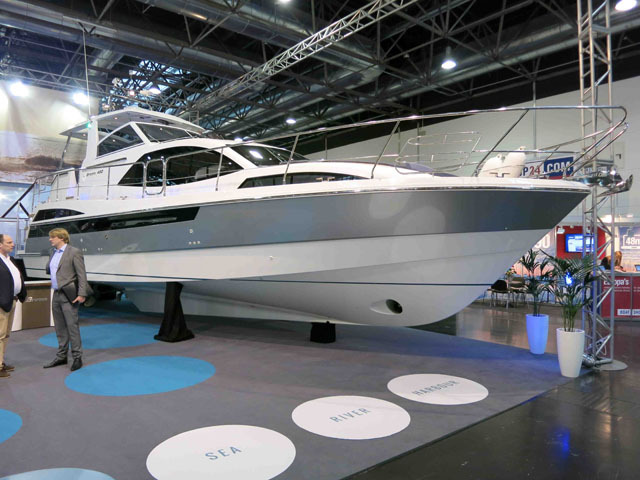 It’s always a pleasure to go to a big international show and see a fondly regarded boat from my homeland – so when I stumbled upon Broom’s new 430 in one of Dusseldorf’s vast, sprawling halls, I was immediately keen to take a closer look (See Alex Smith's Broom 430 First look video). However, even before I stepped on board, it was interesting to note that, in typical Broom fashion, the boat’s classical inland cruiser aesthetics were by no means telling the whole story – because here, as on so many of the builder’s previous designs, the idea is to generate a craft that can perform just as effectively on the open sea as on a sheltered lake. To that end, the gentlemanly external lines are built upon a well proven, semi-displacement, Category B, seagoing hull. To supplement that offshore prowess, there are also some very wide, safe side decks for secure access to the foredeck, plus a pair of extremely broad transom steps (one on either side) to take you from the bathing platform to the imperiously elevated helm. And then there’s that monstrous power rating. 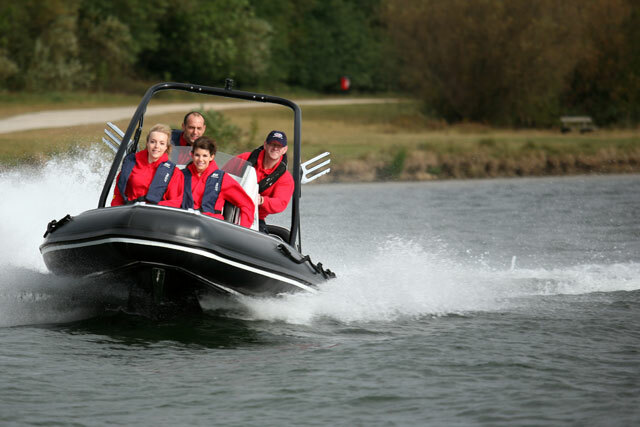 With a quoted range from 370 to 880hp, this is plainly much more than just a six-knot Norfolk Broads plaything. In short, it doesn’t take long to recognise what Broom fans habitually suspect – that this latest model has been designed to handle tough offshore transits with just as much aplomb as more sedentary inland pursuits. Up at the helm, things are ideal. With wheel in hand and an unobstructed view of the entire boat, the position of this section, high up and a long way aft means you get a Skipper’s chair as commanding as any you will see. 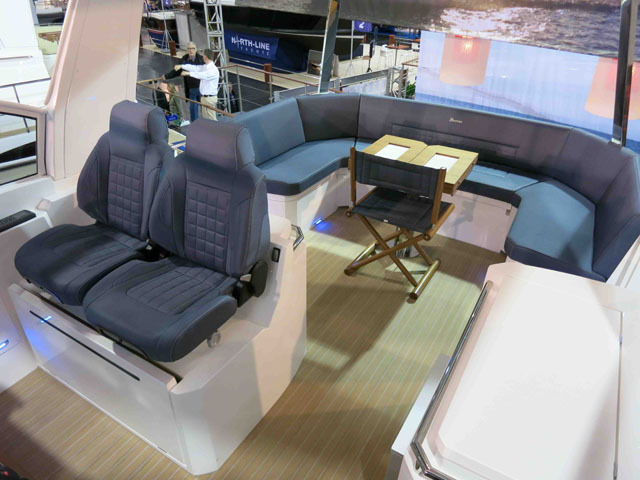 The raised cockpit provides a view of the entire boat and comes with optional hard top and heating. It is also very well appointed, with adjustable shelter courtesy of the (optional) powered sunroof, plus strikingly modern seating, with slick granite fabrics and sculpted contours. Certainly, you can spec a complete hardtop with opening skylights, and you can also pick various heating options for year-round use, but this show set-up with retracting canvas looks like a very effective compromise. 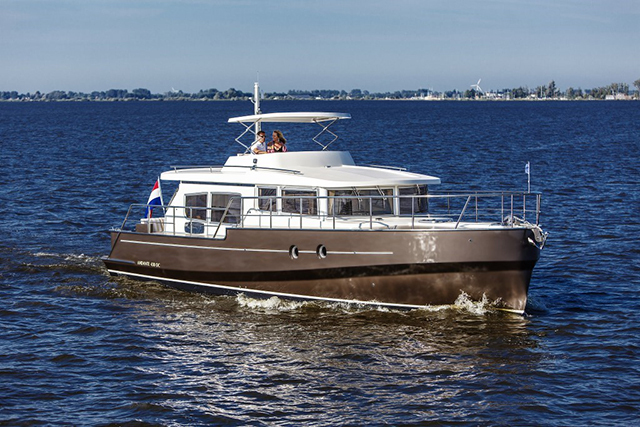 There is also lots of space and a mini-galley to port so you can enjoy a relaxed and sociable meal - but best of all, despite outstanding 360-degree visibility, an air draught of less than 11 feet means the 430 is quite low-profile compared to most conventional flybridge cruisers of a similar scale. Step down below and you will discover a living area of extraordinary space. With the exception of the convertible V-berth in the bow and the full-beam aft cabin, the entire central section is completely open, enabling you to peer down into the starboard galley from the enormous lounge space – or to gaze out to sea through those enormous, flush-fitting, frameless, wraparound windows. The main galley and lounge space below is vast. 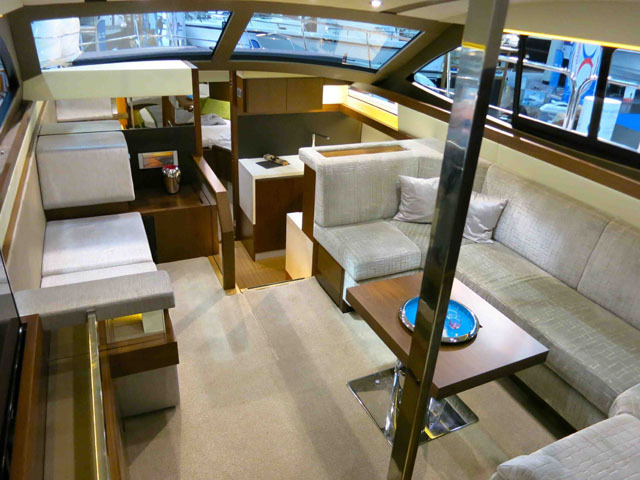 Of course, on a great many boats, the designers go to great lengths to stack deck upon deck, with multi-level shoebox cabins and hidden heads compartments crowbarred into spaces that can barely contain them – and you can understand why they do it. But here on the Broom 430, the gentle up-and-down gradient of this single, multi-level deck means that, while the accommodation feels very intimate and cosy, it is also supremely bright and open, with astonishing headroom and great freedom to move. 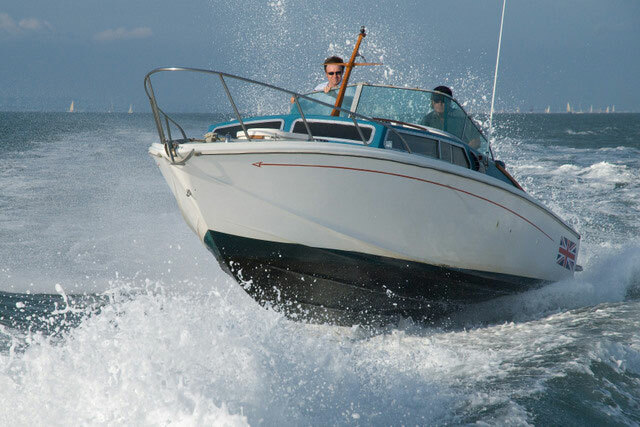 In all fairness, there are some areas of this prototype boat that feel rushed or imperfectly resolved – not least in the pronounced creaking of the floor that accompanies your progress through the galley and in some of the spaces behind hatches, lids and lockers. But for a family of four who want to spend extended periods on board, this very spacious, assured and unforced layout will have enormous appeal. The designers have used a lateral double bed with a matching chaise longue in here because they reckon it helps maximise the view - but the moment you step through the door, it’s clear that it doesn’t work. The steps limit the visibility in the aft cabin – this part of the design could be improved. The space is dominated by enormous external steps and a bathroom that runs all the way along the port side so what might have been an enjoyably panoramic view is in fact radically compromised. 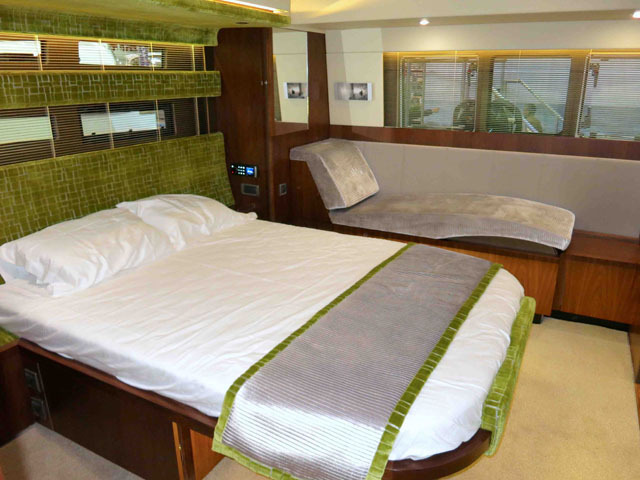 Certainly the scale of the space is impressive, but with textured pale green fabrics that look like the Incredible Hulk’s elbow skin, plus a bewildering hotchpotch of dark woods, pale carpets, square windows, arrow-slot portholes, spotlights, strip lights and that bizarre sideways sleeping set-up, it’s one of the least attractive aft cabin designs I’ve seen. The company does say that it is possible to customise virtually everything in this new boat, but while all three basic layout options make useful tweaks to the central section, none appears to incorporate any substantial structural change to the aft accommodation. If you want to shift the aft cabin around, it might be well worth having a one-to-one design consultation with the builders. The standard layout is customisable - and may be advisable with regards to the aft main cabin. On the basis of this prototype model, it is fair to say that the Broom 430 is a fine idea waiting to be a fine boat. As things stand, a rudimentary finish to some of the finer details and a disappointing aft arrangement cause some nagging doubts on my part. 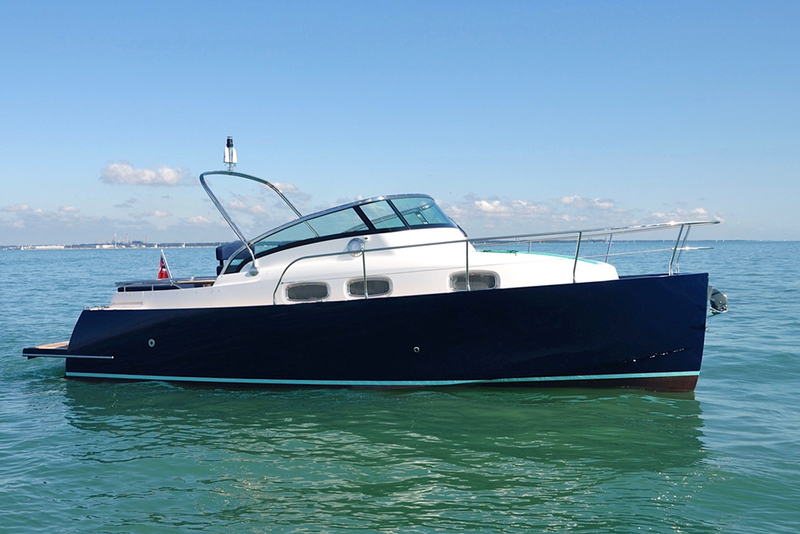 However, since its debut appearance at the Dusseldorf event, I have spoken to a colleague who drove this very boat across the Channel and he had nothing but glowing reports, describing it as a quiet, refined and comfortable distance-maker. Couple that with the fact that Broom is a very well established yard with a hard-won reputation and it’s difficult to imagine that Craft Number One won’t be improved upon with subsequent production models. If that happens in the way that I would hope, then the scale of the internal living space, the multi-purpose versatility of the hull and the unbridled excellence of that helm position might yet make the new 430 a very attractive proposition for the keen family cruiser. For a great selection of similar and directly comparable European cruisers, see: Five great European Cruisers.